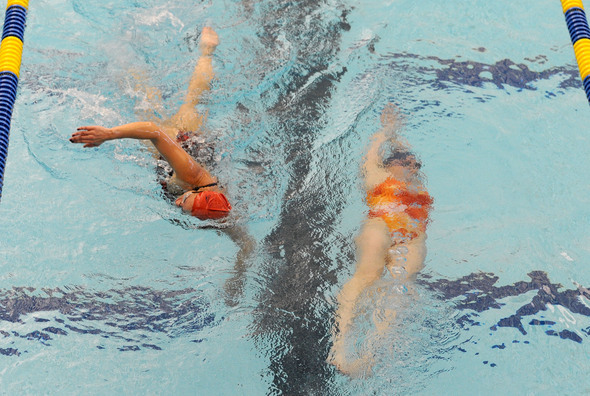 Amanda Mercer, left, and Susan Butcher pass each other in the Canham Natatorium pool during their training session to prepare for their upcoming swim of the English Channel. The swim will raise money for ALS research. Mountain climbers may have Mount Everest, but six swimmers based in Ann Arbor have a different kind of summit: the English Channel. The six women, ages to 32 to 44, will attempt to swim a double crossing of the English Channel this summer, all the while raising funds and bringing attention to ALS (Lou Gehrig’s disease), hoping to break a world record and meet a personal challenge that for many competitive swimmers remains a fantasy. “It’s the Mount Everest of swimming,” said Amanda Mercer, who organized the Channel relay swim with the goal of raising $120,000 for ALS research. From left: Susan Butcher, Bethany Williston, and Amanda Mercer take a break during their training session to prepare for their upcoming swim of the English Channel. While most of the six women, who swam competitively in college, harbored dreams of swimming the Channel, it wasn’t until Mercer went looking for a way to raise funds and awareness for ALS (amyotrophic lateral sclerosis) that she hit upon the idea of a relay swim across the Channel. ALS is a rapidly progressing and fatal disease that robs patients of muscle strength and movement. Mercer sits on the board of Ann Arbor Active Against ALS, a private, nonprofit grassroots organization dedicated to raising funds for the treatment and research of the disease. A2A3 was founded after Mercer’s neighbor Bob Schoeni, a University of Michigan professor, was diagnosed with ALS in 2008. A couple of months later, friends and neighbors founded A2A3 in an effort to support ALS research. They have raised more than $100,000, said Suzanne Ross, president of A2A3. The women - three are mothers, some work full time, others coach - have had to squeeze in practice and conditioning. They swim five to 10 hours a week and condition when they aren’t in the pool. Preparations will pick up soon as the date nears. They’ll also travel to Lake Michigan in the spring to acclimate to cold water. Wet suits, according to the Channel Swimming and Piloting Federation rules, are forbidden. Worried about the cold, team member Jenny Jalet needed to test the waters - literally - before she made the commitment. When she was visiting Maine last summer, she took a 20-minute swim in the Atlantic Ocean. On a shuttle to the beach, her young son told the bus driver his mother was going to swim the English Channel. From bottom: Susan Butcher, Amanda Mercer, and Bethany Williston train at Canham Natatorium. “I felt committed at that point,” she said, “because the Acadia Park bus driver thinks I’m going to do it.” And her test swim? “It wasn’t as bad as I thought,” she said. 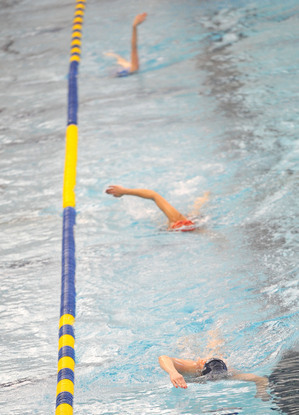 Each swimmer will take one-hour shifts in the water, and must remain in order as the relay progresses. When they’re not in the water, they will be on a 35-foot boat with a pilot. Team member Bethany Williston’s biggest worry isn’t the conditioning or the crossing. It’s seasickness. She plans to wear a patch to prevent seasickness. Each team member is footing their own travel and lodging bill, borrowing frequent flyer miles where they can. All of the fundraising will go to ALS research. They will travel to England a few days before and be ready to swim anytime between July 25-31 when there is a neap tide, when the tide’s range is at its lowest. Weather is always unpredictable, the water is cold (60 degrees) even in late July and there are currents. They will swim the Strait of Dover, at 21 miles the narrowest distance across the Channel. Because it’s a two-way crossing, and because tides don’t allow for a straight crossing, the swimming distance will be more than 42 miles. They hope to break the women’s two-way relay record of 18 hours, 59 minutes. The team is about to launch a national campaign announcing the relay next week. They are hoping to catch the eye of a national celebrity such as Ellen DeGeneres or Oprah Winfrey, and have already received notice from actress and television host Kelly Ripa and football stars Dhani Jones and Desmond Howard, who have all retweeted the event. “Kelly Ripa alone has 350,000 followers,” Mercer said. Ann Arbor resident Amanda Mercer, 43, swam for Michigan State University. 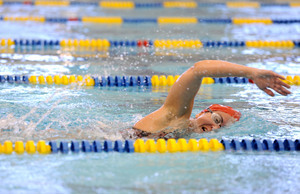 Jenny Jalet, 40, swam at U-M and works in development at the U-M athletic department. Susan Butcher, 33, swam for Eastern Michigan University and is a contracted athletic trainer at Canton High School. Amanda Mercer, 43, swam for Michigan State University and is an attorney. Bethany Williston, 40, swam for Yale University and is a swim coach. Melissa Karjala, 32, played water polo for U-M and is a research administrator at U-M. And Emily Kreger, 34, swam at Yale and is a medical resident in Detroit. She is the only one who does not live in Ann Arbor. For more information on the crossing or on A2A3, go to http://www.channelforals.org/ or http://www.a2a3.org/. Sun, Feb 12, 2012 : 6:03 p.m. This is a totally awesome fund raiser for a very wonderful cause. Go girls, go!! My first (and certainly not last) encounter occurred when a family friend was diagnosed in his very early 40's. He left two teenagers and a fabulous wife behind. Sun, Feb 12, 2012 : 1:31 p.m.
How about a calendar? Each swimmer could get one month of a &quot;dry&quot; workout and one month in the Channel swimming. This way they could make money after the event is over also. Sun, Feb 12, 2012 : 12:52 p.m.
God bless you young ladies. I know you will do well -- be safe.